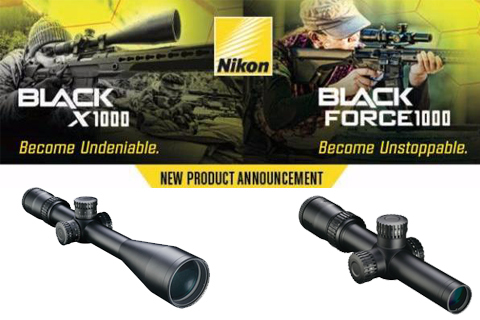 Melville, NY – Nikon doubles down on its commitment to American shooters with the introduction of the new BLACK riflescope series-a new category of dedicated optics with models engineered for both precision long-range rifle and action-shooting AR enthusiasts. For the precision rifle shooter, Nikon’s BLACK X1000 is offered in a range of 4-16×50 and 6-24×50 models with X-MRAD or X-MOA tactical-style reticles synchronized to elevated windage and elevation turrets. Accurate and repeatable, the adjustments enable precise dialing of elevation come ups and wind compensation, while each of the new reticle designs present the shooter with a visually clean, yet highly functional and advanced tool for estimating range or maintaining holdovers. Shooters looking for rapid-action targeting capability with AR/MSR platforms can rely on the new BLACK FORCE1000 1-4×24 riflescope with capped turrets and SpeedForce reticle. When the riflescope is dialed down to its true 1x magnification, the reticle’s illuminated double horseshoe center portion serves as quick reference for reaction-speed target acquisition and engagement, as well as for establishing moving target leads. The SpeedForce MOA reticle also integrates BDC circles and hash marks for precise intermediate-range target holdovers. The new BLACK series reticles can be applied to virtually any shooting application, regardless of caliber or ballistic performance and can be further optimized for specific shooting situations utilizing Nikon’s Spot On Ballistic Match Technology. BLACK series riflescopes all feature a 30mm main body tube built with aircraft-grade aluminum alloy and Type 3 hard anodizing, providing exceptional ruggedness and optimum strength-to-weight ratios. 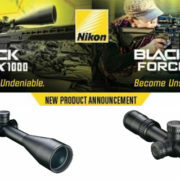 Each riflescope has an optical system built from Nikon’s lead- and arsenic-free glass Eco-Glass, which is optimized with the company’s full multilayer coating on all air-to-glass lens surfaces. Spring-loaded instant zero-reset turrets provide precise, repeatable corrections on all BLACK riflescope models. And like all Nikon riflescopes, the new BLACK series is backed by the company’s No Fault policy for repair or replacement. Nikon Inc. is the U.S. distributor of Nikon sports and recreational optics, world-renownedNikon 35mm cameras, digital cameras, speedlights and accessories, Nikkor lenses and electronic imaging products.